This book examines the relationship between nihilism and postmodernism in relation to the sublime, and is divided into three parts: history, theory, and praxis. Arguing against the simplistic division in literary criticism between nihilism and the sublime, the book demonstrates that both are clearly implicated with the Enlightenment. Postmodernism, as a product of the Enlightenment, is therefore implicitly related to both nihilism and the sublime, despite the fact that it is often characterised as either nihilistic or sublime. Whereas prior forms of nihilism are 'modernist' because they seek to codify reality, postmodernism creates a new formulation of nihilism - 'postmodern nihilism' - that is itself sublime. This is explored in relation to a broad survey of postmodern literature in two chapters, the first on aesthetics and the second on ethics. 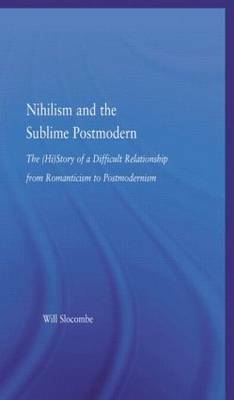 It offers a coherent thesis for reappraising the relationship between nihilism and the sublime, and grounds this argument with frequent references to postmodern literature, making it a book suitable for both researchers and those more generally interested in postmodern literature.